Protesters surround a minivan on Bay Street in front KFC to prevent it from passing through protest action on Thursday. 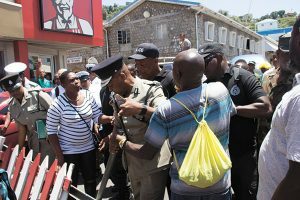 There was bedlam on the streets of Kingstown yesterday, when about 150 people blocked traffic and scuffled with police officers. 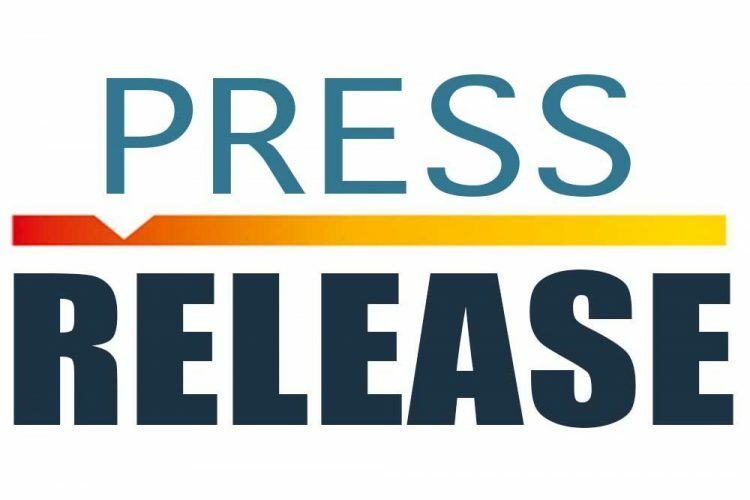 The group descended on the capital just after 10 am to protest the decision by Justice Stanley John to dismiss the Election Petitions filed by two candidates of the opposition New Democratic Party (NDP). Six times, the police had to divert traffic away from the blocked roads. Justice John declared at the High Court yesterday that Montgomery Daniel and Louis Straker of the governing Unity Labour Party (ULP) had been validly returned in the December, 2015 poll. Commissionner of Police Colin John removes a barricade on Bay Street while a protester tries to stop him. 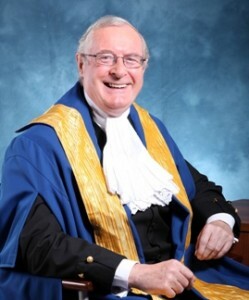 It was also said that the Petitioners will pay the Respondents’ cost and that cost will be assessed if not agreed. 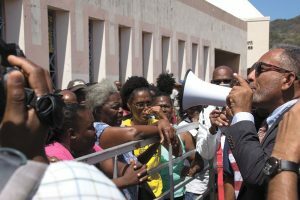 Minutes after the judgement was given, Dr Godwin Friday, leader of the opposition addressed some of his supporters in front the Vegetable Market, where some were shouting their intention to protest and block the streets of Kingstown. “This country belongs to all of us. We will continue this struggle until this government is replaced and we could change St Vincent and the Grenadines for the better. After his speech, the opposition leader, along with NDP politicians Nigel “Nature” Stephenson, St Clair “Major” Leacock, Roland “Patel” Matthews, Benjamin “Ben” Exeter, Lauron “Shearer” Baptiste and several NDP activists and supporters took to Halifax Street where they hindered the free flow of traffic, causing chaos. 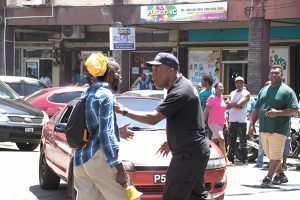 In the area of the SINGER Building on Halifax Street, Commissioner of Police (COP) Colin John attempted to remove supporters who were banging on a minivan that was trying to inch its way through the crowd with passengers inside. Superintendent Hazelwood (right) rebukes a protester who touched his firearm during the protest action. The weapon was hidden under his shirt. The COP’s attempt to clear the road angered the crowd. Several persons ran up to the Commissioner, hurling insults and using threatening language. Several police officers surrounded the COP. There were angry exchanges, during which members of the mob hurled expletives at the COP and his officers as the crowd moved along. At one point, the COP was assaulted by a woman, but he kept his cool. Later, a man shouted at the COP for trying to get Stephenson to move from in front a vehicle. The angry crowd moved along Granby Street where it blocked the Forester’s Court intersection with pieces of wood, debris and tree limbs, forcing the police to turn back traffic that was heading into Kingstown, as Dr Friday and several supporters knelt or sat in the road. After about 30 minutes, a few large trucks began appearing and this caused the crowd to disperse for a while. The crowd eventually moved along James Street and made their way to Upper Bay Street as shouts to block the road continued. When the crowd arrived in front the KFC building on Bay Street, they again blocked the road, this time with steel barriers belonging to the fast food establishment. Workers of the fast food chain came to retrieve their barriers and small tug of war ensued, with the KFC workers winning that battle. And almost immediately after that tussle had dissipated, other members of the crowd huddled together in the middle of the road to prevent vehicles from passing freely. One person wanted to light the debris but other protestors urged him not to. 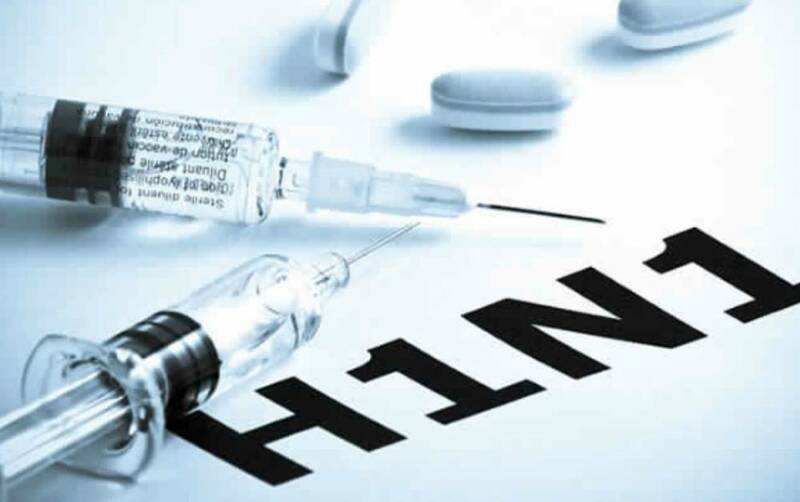 Several high ranking police officers and members of the Rapid Response Unit (RRU) had intervened earlier to try to gain control of the crowd, while traffic police diverted the disrupted traffic up James Street, where the traffic usually flows one-way, in the opposite direction. The leadership of the Green Party, Ivan O’Neal and Cadmiel McFee also joined NDP supporters in the streets of Kingstown to protest the Election Petition judgment. “We are lending our support to the democracy of this country. This is not just a political matter. This is a matter of democracy. 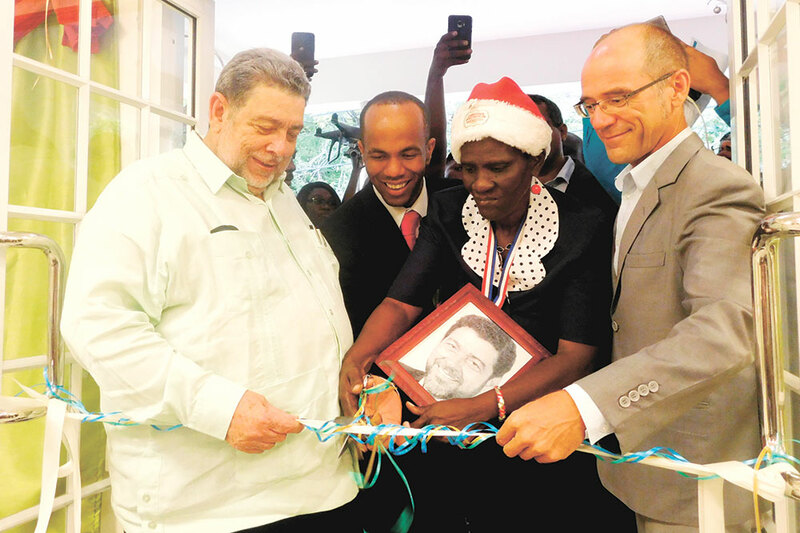 Less than 24 hours since Prince Charles flew into this country, we are now seeing the forceful hands of Ralph Gonsalves and his regime yet again. This is about democracy. We are standing here in the interest of democracy and yes, we will lend our support to the New Democratic Party,” McFee, the deputy leader of the Green Party said. The crowd, which did not seem deterred by the Police presence, continued marching down Bay Street as they shouted repeatedly, “No Justice, No Peace”. Their next stop was on the corner of Bay Street and Egmont Street in front of the Financial Complex, where they again attempted to stop the flow of traffic. At this point, Superintendents of Police Trevor “Buju” Bailey and Timothy Hazelwood; Commissioner John and several other police officers had to once again divert traffic, this time from Bay Street, up Egmont Street, where the traffic is meant to flow in the opposite direction, one-way. Opposition Leader Dr Godwin Friday (right) speaks to New Democratic Party supporters outside the Kingstown Market after hearing the verdict from Justice Stanley John dismissing his party’s elections petitions. The high ranking police officers instructed the junior officers to not use force against the protestors, but to remain calm and try their best to try to get traffic to flow freely. 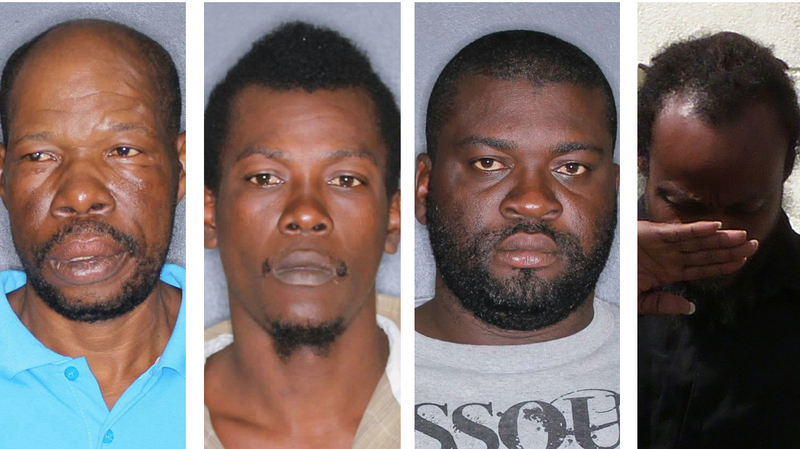 In one incident, a Rastafarian man wilfully touched Superintendent Hazelwood’s firearm which was under his shirt, and was strongly rebuked by the senior officer. 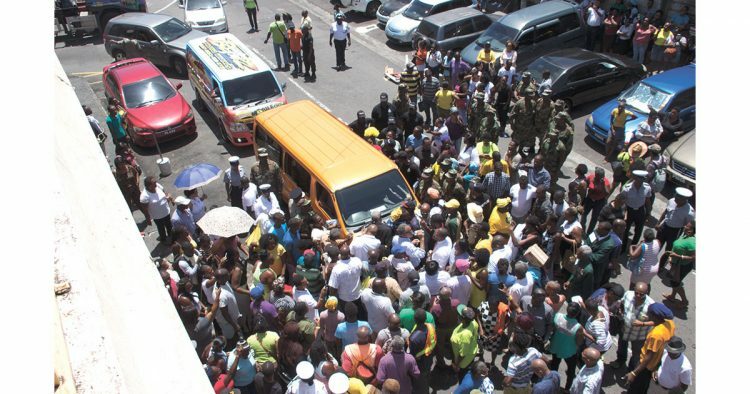 The angry protestors were joined at one point by NDP activist Collin “Hitman” Grahame as he stood in front of the SUV of former government minister Sir Vincent Beache, which had driven down Bay Street and was attempting to make its ways into the Financial Complex. Persons hurled insults at the former ULP politician, telling him that he deserved to be caught in the mele as he was involved in the road block prior to the Grand Beach Accord in 2000. Police eventually pushed the crowd out of the way and Sir Vincent managed to go on his way. Protestors remained on Bay Street until a little after 2 pm, with the crowd and the police being involved in heated standoffs on several instances as the officers tried to get the traffic to flow freely. At one point, Commissioner John and Dr Friday had a heated exchange when the opposition leader stood in front a vehicle and refused to move. Also blocking the road with his SUV at one point was parliamentary representative for West Kingstown Daniel Cummings, who when asked to move by Superintendent Bailey responded by saying he could not, because he did not want to run over NDP supporters. At one point, Stephenson (parliamentary representative for South Leeward) suggested that Cummings open the bonnet of his SUV to make it look as if the vehicle had broken down. “We will continue our protest and our fight against this government, but listen for the action and when we call you, come,” the Leader of the Opposition told his supporters. He encouraged them to fight for change and urge their neighbours and people around them to speak out against the government without fear. “This country don’t belong to Ralph and his family. It belong to all of us. Mobilise, don’t be afraid to speak out. Even in your church groups, school groups, social groups in your community, discuss the future of this country…,” Friday said. He continued; “this is not a day for us to be dismayed, this is not a day for you to lose heart, this is not a day for us to mourn and be sorrowful. 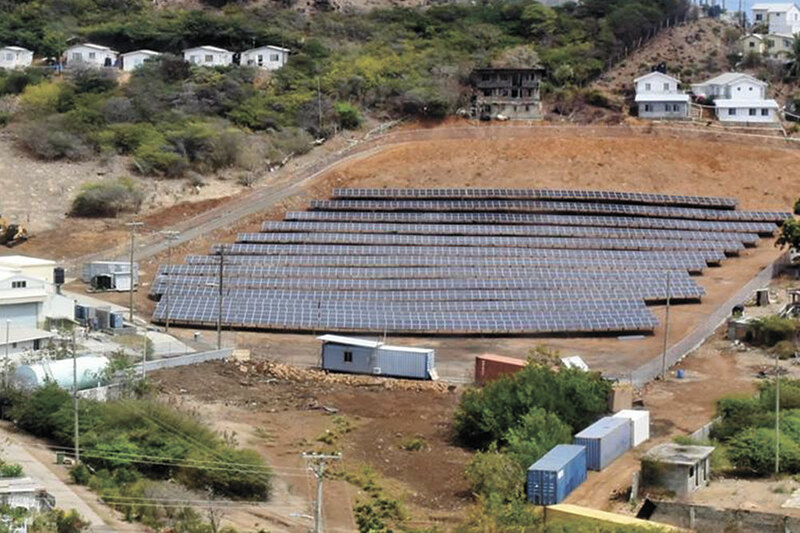 Today is the day to take action, for us to commit ourselves to bring change in St Vincent and the Grenadines”.